This is my beagle, Murfee. 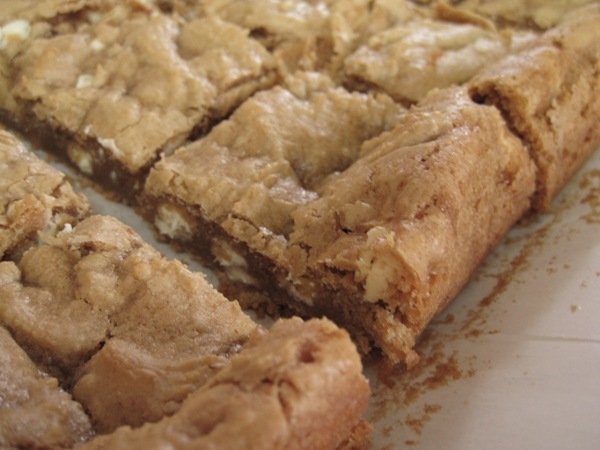 No, she did not help me make these cookie bars but I did bake them for her vet’s office. We have a terrific vet’s office. Murfee even likes them despite the poking, prodding and surgery she had to endure. 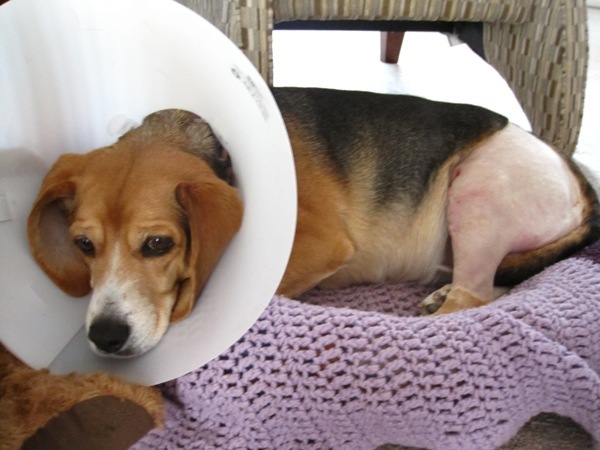 Two weeks ago she had surgery to fix a torn ligament in her left knee. Doesn’t she look pathetic. Her little shaven leg looks like a fresh chicken drumstick! She wouldn’t stop licking at the stitches so she had to wear the evil, evil cone. We like to call it her helmet. She is not a fan. The first 2 days in the helmet she seemed to think she had to walk backwards. I think it was her way of trying to pull her head out of it. I finally got the dog (who I did not fall on, thank goodness) in the car and got away from there as quick as possible! When I got home I realized that not only had I ripped a hole in the knee of my jeans like a grade school tom boy, but I was also bleeding! As in blood dripping down my leg. Awesome. So now I have my own scab and very sore bruise which has made it pretty painful to do yoga classes or anything else on my knees (minds out of the gutter, people) the past couple weeks. I can sympathize, Murf. 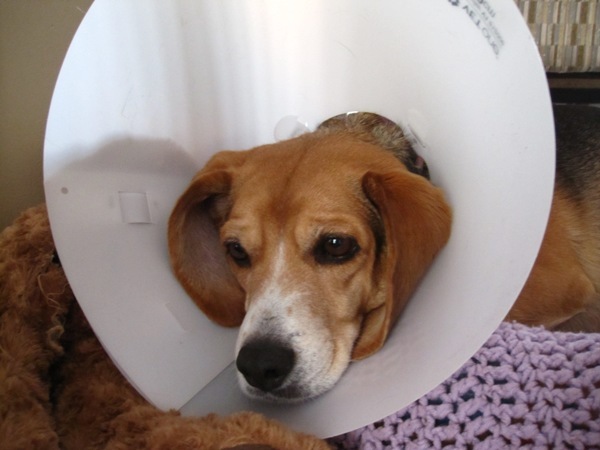 Murfee is much better in the cone now. She can navigate around the house with no problem. However, it is very loud in the middle of the night when she scapes it on the wall 10 times while spinning in circles to get comfortable on her little bed. 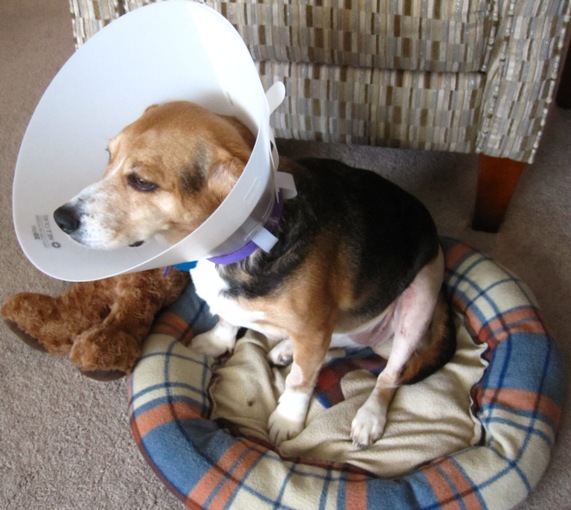 The wound is healing nicely and she is using that leg again most of the time now. She has even let up on the licking some and has been spending more time without the cone than with it. Thanks, Dr. Joe and staff! 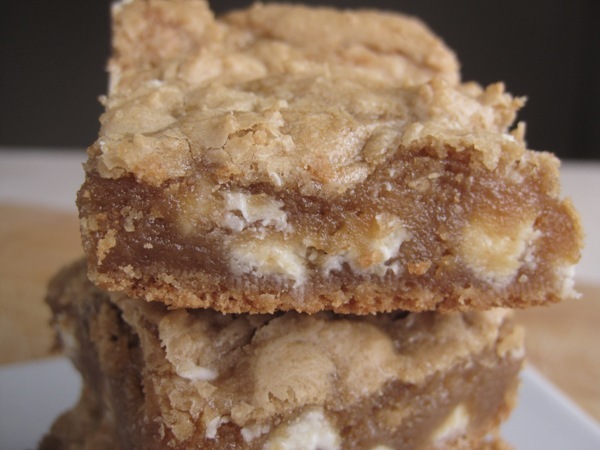 This blondie recipe is a keeper! Very easy. Pretty much a one bowl recipe. 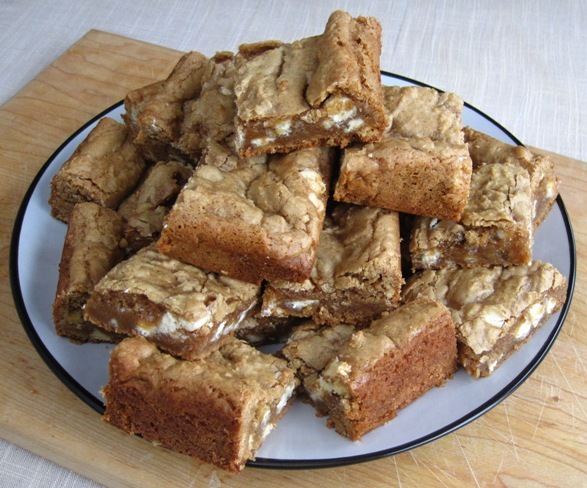 These are actually a variation on a cookie bar my mom and aunt always made when I was a kid. I’ll share that one with you guys at a later date. You’ll need a parchment lined 9 x 13 pan. If you make the parchment a little longer than the pan on both ends then you’ll have a little handle on either end to lift them out of the pan once they are cooled. This makes it super easy to cut them and get nice clean edges. I bet semisweet chocolate chips would be good, too. The white chocolate is a nice compliment to the spice flavor of the Biscoff, though. These are rich. . .a glass of milk might be in order. Or a scoop of ice cream!! Melt and cool the butter. Add the brown sugar and the Biscoff and mix well. Add the eggs one at a time and mix well. Add all the dry ingredients. Mix until combined. Stir in the white chocolate chips. The mixture will be thick and sticky. Spread it into a 9×13 pan that is greased and lined with parchment paper. Bake at 350 degrees for 25 to 30 minutes. Cool in the pan before removing to cut. Mine did not come out like your picture. At all. 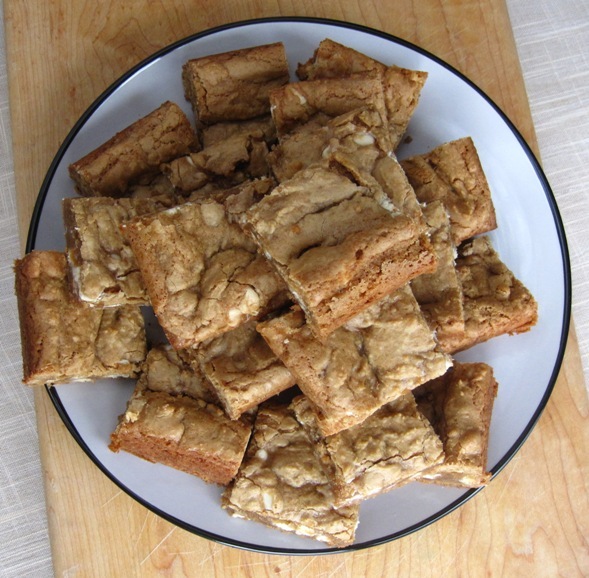 Mine were super cakey…not like blondies at all. Any idea why this happened?